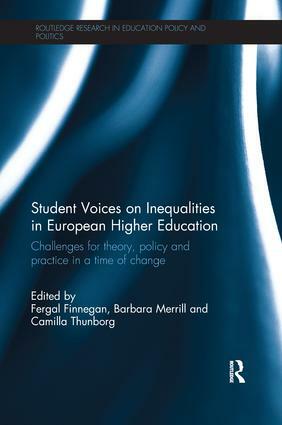 This book focuses on the voices and experiences of non-traditional students in European higher education. It examines the impact that access to higher education is having on these students’ lives and discusses what this tells us about European education and society. In particular, it explores the multi-dimensional nature of inequality in varied national contexts focusing on the issues of class, gender, ethnicity, age and disability. The book contributes to the on-going debate about the changing nature of European higher education and argues that research based on the experiences of non-traditional students can be used to improve policy and practice in tertiary education. • the implications of these findings for practice and policies. Student Voices on Inequalities in Higher Education will appeal to academics, researchers, policy-makers and practitioners working in higher education institutions as well as people working in the field of widening participation, adult education, access and centres for teaching and learning. It will also be of interest to postgraduate students in higher education.